The Best Construction blogs from thousands of top Construction blogs in our index using search and social metrics. Data will be refreshed once a week. Also check out Construction Podcasts. Construction newsletter is a comprehensive summary of the day's most important blog posts and news articles from the best Construction websites on the web, and delivered to your email inbox each morning. To subscribe, simply provide us with your email address. New York, NY About Blog ENR is a stand-by construction magazine that has been around since 1874. Always offering the latest construction industry data, analysis, news and commentary, it is a must for all construction professionals, from contractors to suppliers to regulators. Facebook fans 16,845. Twitter followers 49,193. UK About Blog The Construction Index is one of the leading online information sources for the UK construction industry. The website provides a wide range of content including - comprehensive coverage of the main news and issues affecting the construction industry; contract leads, tenders, and awards; in depth market forecasts; construction law analysis. Facebook fans 4,595. Twitter followers 79,453. About Blog A place for tradespeople to discuss the industry. Construction, contracting, building, electrical, HVAC, plumbing, subcontractor, feed by reddit. Facebook fans 1,210,772. Twitter followers 578,890. Blackfriars, London About Blog The UK's leading magazine for construction professionals featuring the latest news, expertise and intelligence from the Building industry. Facebook fans 4,389. Twitter followers 74,239. Tuscaloosa, Alabama About Blog Equipment World serves up the latest news in construction, heavy equipment, pickups and everything else that helps you get the hard work done. Facebook fans 116,173. Twitter followers 9,135. London About Blog Construction News is a UK-based magazine. With an emphasis on market intelligence, forecasting, and trend analysis, this resource is great for companies looking to figure out how to stay ahead of the curve. Facebook fans 9,241. Twitter followers 90,625. London, England About Blog Follow to keep up with Construction news, building news, construction jobs, contracts news and more from the Construction Enquirer. Facebook fans n/a. Twitter followers 47,732. About Blog Construction Dive is like the Wall Street Journal of the construction industry. They keep track of industry stock prices and job trends, and publish commentary on where they see the future of the construction industry going. They also provide articles on current events with in-depth analysis. Facebook fans 1,419. Twitter followers 9,318. Chicago, IL About Blog Contractor features news and features on emerging technology for contractors in plumbing, heating, specialty piping and fire protection systems. Contractor Magazine, has been helping contractors build their business since 1954. Facebook fans 2,093. Twitter followers 29,179. College Station, TX About Blog We are construction technologists who geek out on a weekly podcast, offer media and PR services, and present for construction industry professionals at events around the world. On our podcast, we discuss news and current trends within the construction and technology industries with a special guest each week. Facebook fans 569. Twitter followers 3,141. About Blog Professional Builder magazine provides breaking news, industry trends, product innovations, and best practices for the U.S. home building industry. Facebook fans 631. Twitter followers 3,611. Global About Blog Delivering Architecture, Construction, Engineering and Interior Design news and analysis from across Australia and around the world. Facebook fans 5,771. Twitter followers 5,519. Arlington, VA About Blog Looking for the latest trends in construction technology? Capterra blog makes business software recommendations and explains how innovations are changing the industry. Here you will find the latest updates for best tools and software to help builders and contractors succeed. Facebook fans 10,719. Twitter followers 15,065. Bend, Oregon About Blog My name is Kent Griswold and I have developed this blog because of my love of small spaces.Tiny houses have also become an interest to me in the last few years and I have combined my interest in both of these to publish this blog. The Tiny House Blog was established in May of 2007. The goal of the tiny house blog is to discover the different options available for a person looking to down size. Facebook fans 263,790. Twitter followers 18,204. Copenhagen, London About Blog GenieBelt is a technology start-up founded by construction industry professionals frustrated by having to repeatedly tackle the same old problems. Subscribe us for regular updates on construction news, industry insights and a little revolution we have started. Facebook fans 1,506. Twitter followers 8,412. About Blog Construction Junkie is the construction industry's source for all of the latest and greatest Construction News, Technology, Safety, Tools, and more! Facebook fans 3,700. Twitter followers 11,156. Clarkesville, GA About Blog Construction Technologist” Robert McKinney brings you ConAppGuru, the ultimate resource for construction technology. McKinney reviews the best construction apps, hardware, and strategies to get your company up to speed on the latest technology. Whether you are a one-man operation, owner of a large construction firm, tech fan, or completely clueless about construction technology. Facebook fans 415. Twitter followers 7,320. North America About Blog Sage Construction’s blog focuses on creating conversations with Sage customers, potential customers, and construction and real estate industry friends. The blog features tips, trends, product news and more – all geared toward construction industry professionals and managers. Facebook fans n/a. Twitter followers 25,379. Suwanee, GA 30024 About Blog While Commercial could function as a basic construction news site, its real strength comes from its job board. Subcontractors and contractors can use its list to bid on projects, all online. Facebook fans n/a. Twitter followers 644. Cincinnati, OH About Blog Get access to bidding commercial construction projects and information with ConstructConnect. We transform the way the construction industry does business. Facebook fans 197. Twitter followers 43,421. Global About Blog The worlds most trusted construction management platform, connecting project teams & processes. Drive performance across your project, portfolio & business. Here you will find all the latest construction project management news, software, resources, and best practices. Facebook fans 4,457. Twitter followers 2,500. About Blog Sandvik Construction specialize in equipment, tools and service for the breaking, drilling and crushing niches in the construction industry. Application areas include tunneling, quarrying, road building, demolition and recycling. Facebook fans 6,554. Twitter followers 2,418. About Blog Our mission is to provide all the job updates and necessary information from Construction, Infrastructure, Real Estate, Project and Oil and Gas sectors to the all job aspirants and students. Facebook fans 11,654. Twitter followers n/a. Seattle, Washington About Blog A discussion of modern design from the Northwest. This blog is really about architecture, but they deserve a mention as one of my favorites. The projects and ideas they share are stunningly artistic and wonderfully designed. If you are into modern architecture, check them out. Facebook fans 4,237. Twitter followers 4,813. About Blog Construction Management with John Chaney is the blog for Dexter Chaney, which has become the first construction company to deliver complete construction management software using true cloud-based technology with an intuitive web browser interface. One of the founders of Dexter Chaney, John Chaney authors the blog posts, which are just as useful for construction managers. Facebook fans 532. Twitter followers 1,300. About Blog The official blog of the successful company ModSpace, this blog’s niche is modular building. The authors do a great job of providing quality content in their area of expertise. Facebook fans 2,218. Twitter followers 2,246. Houston, TX About Blog Whirlwind Steel Buildings designs and manufactures a complete line of metal building systems and metal building components including metal roofs, walls and panels. Facebook fans 11,520. Twitter followers 357. About Blog Construction Specifier is a solutions for the Construction Industries. Miami About Blog Find answers to all of your Florida Construction Law questions, TheLienZone.com, Published weekly by board certified Miami construction lawyer Alex Barthet. Facebook fans 330. Twitter followers 486. London, UK About Blog This blog is a bit dated on the user interface side of things, but it makes up for that by providing a great level of in-depth data. Within their posts, they offer graphs and data sets that will help you better understand what is going on in the construction industry. Facebook fans 70. Twitter followers 13,575. Dublin City, Ireland About Blog 3DPersonnel- Construction recruitment specialists, this account is used for the recruitment of professional & technical staff through-out Ireland and the UK. Facebook fans 506. Twitter followers 427. About Blog Beyond Design is the blog that intends to show how BIM design data can help construction managers increase productivity by improving workflows, influencing the design, and managing projects in a better way overall. Facebook fans n/a. Twitter followers 16,784. Carol Stream, IL About Blog Constructech is a fantastic resource that offers some news, but also intuitive information that catches attention and provides valuable insight to the construction industry. The blog can also come in the form of a magazine, which is preferable to some. Facebook fans n/a. Twitter followers 6,403. UK and Dubai About Blog Construction Law Blog from the team at Gateley Plc. About Blog The Construction Contractor Advisor was created to offer legal discussion and encourage the use of social media in the construction industry. Facebook fans 10,172. Twitter followers 12,708. Indiana, North Carolina About Blog Shiel Sexton Company is a nationwide construction management firm. The blog offers a glimpse into the organizations culture and employees, and construction managers will find it helpful to see what it is like from the inside of a nationwide construction management blog. Facebook fans 833. Twitter followers 1,260. UK About Blog Welcome to The UK Construction Blog, a place where everyone is free to post news, comments, products and relevant information about the UK Construction Industry. Everything Surveying, Architectural & Construction Related. Facebook fans n/a. Twitter followers 52,116. Mid-Atlantic Region About Blog Wohlsen has been providing construction services for over 125 years. Its core markets include healthcare, senior living, higher education and green buildings. Facebook fans 121. Twitter followers 1,044. Austin, TX About Blog Welcome to the Contract Simply community, where lending and real estate development industry experts share their wisdom on construction loan management, construction draw software, compliance, machine learning in banking, and ways to better manage your construction administration services. Facebook fans 48. Twitter followers 88. Lansing, MI About Blog At Granger Construction, we strive to truly understand our customers’ vision and aspirations. We listen intently, collaborate closely, and consistently build results that make a positive impact on the communities they serve. Facebook fans 509. Twitter followers 497. UK About Blog The CHS seeks to bring together people from a wide range of professional and academic disciplines who are enthusiastic about construction history. Facebook fans n/a. Twitter followers 159. About Blog A blog by Merrill Stewart, founder and President of commercial builder Stewart Perry. Stewart writes some very insightful content from an obviously educated and experienced point of view. Facebook fans 414. Twitter followers 4,657. About Blog Welcome to talk.build, an independent website set up to exchange news and views about the construction industry. We are not linked to any other publishing group and only post blogs that want to contribute knowledge, information and up to date views about our market place. Telford, Shropshire About Blog Product Update blog by Gemma Edwards for specifiers working across the architectural, construction and building sector. Facebook fans 191. Twitter followers 4,365. About Blog cnstrcr.com is a social construction website and blog for people to come and share their ideas, stories, and advice. Facebook fans 4. Twitter followers 810. About Blog Run through Englewood Construction Management, the Hard Hat Chat blog is an excellent resource for those interested in commercial construction, development, and management. While updated less-frequently than one would like, these blog posts offer original intuitions about niche construction sectors—like new restaurant building—that will, at the very least, make you think. Facebook fans 156. Twitter followers 283. Minneapolis, MN About Blog Founded in 1981, Stahl provides quality, competitively-priced general contracting, construction management, and design/build services. We focus on the process of evolving the built environment and ensuring our partners find success in their endeavors. Facebook fans 127. Twitter followers 808. New Delhi, India About Blog This blog is an information center where you can find posts related to construction. This content will be very useful for the general public who are searching for construction materials online but first want to do some research on construction or about the construction materials. Facebook fans 5,191. Twitter followers 85. Australia About Blog Mates in Construction is a charity established in 2008 to reduce the high level of suicide among Australian construction workers. Show your support today. Facebook fans 11,850. Twitter followers 1,225. Seattle, WA About Blog The OAC team has successfully been involved in “niche design and construction disciplines” for years. For construction and project managers, OAC offers resources to help from planning through closeout. The blog showcases the projects and events of the OAC construction and project management team, and shows how construction managers can give back to the communities in which they work. Facebook fans 202. Twitter followers 95. Ticino, Switzerland About Blog LE MURA COSTRUZIONI is a company founded in 1992, operates as a general contractor in the field of private and industrial construction. Over the decades it has completed numerous works such as industrial complexes, nursing homes, sheltered workshops, buildings & individual houses. Such constructive methodology allows the developer to have a single point of reference, with which to discuss the different phases, design and realization, concerning the work in progress. Facebook fans 24. Twitter followers 3. Atlanta, GA About Blog DRB Consulting is a construction project management company that offers consulting in the construction development & design industries. From project management to disaster restoration, DRB tailors our construction management services to meet your unique needs. Facebook fans 155. Twitter followers 264. Worldwide About Blog With a focus on sustainable homes, natural materials, and green technology, Jetson Green offers a more specialized approach to the world of construction management blogs. Construction managers can look to Jetson Green for tips and strategies on this new direction in building with the environment in mind. Facebook fans 15,763. Twitter followers 15,090. Munich, Bavaria About Blog Building Radar provides detailed information on construction projects and the companies involved. YOUR source for new construction sales leads! Test us now. Facebook fans 670. Twitter followers 237. Ireland About Blog The Construction Industry Federation (CIF) is the representative body for construction companies & contractors working across all sectors in Ireland. Facebook fans 1,591. Twitter followers 3,976. About Blog Utilizing comprehensive construction knowledge and industry expertise, CORE provides exceptional building services in 11 markets. Facebook fans 1,060. Twitter followers 336. Rockville, Md About Blog The Aronson Construction Report is especially helpful for construction managers looking for business insight, tax tips, financial issues, and more information written by industry experts. Facebook fans 297. Twitter followers 1,081. Toronto About Blog A leading provider of advanced enterprise software solutions for construction and capital project firms, CMiC helps users access real-time information from the field and project executives to complete projects on time and within the budget. Facebook fans 269. Twitter followers 1,139. Edmonton, AB About Blog The Edmonton Construction Association (ECA) is a Non-Profit Construction Association serving the Commercial, Institutional and Industrial Construction Industry in Western Canada. Facebook fans 615. Twitter followers 1,639. Philadelphia About Blog This blog, produced by Cohen Seglias Pallas Greenhall & Furman, offers legal information & resources for federal construction contractors including those involved in military and civil works construction. Facebook fans 128. Twitter followers 452. Los Angeles, CA About Blog Dirty Girl Construction, Inc. (DGC) is a full-service general contracting company, serving both residential and commercial clients in the greater Los Angeles area. Facebook fans 632. Twitter followers 31. Toronto, Ontario, Canada About Blog Marshall Leslie is the owner of Toronto based consulting firm M. Leslie Inc., and an industry resource you will definitely want to check out. This blog offers up observations on the North American construction industry. Facebook fans n/a. Twitter followers 2,036. About - Engineering News-Record provides the engineering and construction news, analysis, commentary and data that construction industry professionals need to do their jobs more effectively. About - Our mission is to provide busy professionals like you with a bird's-eye-view of the construction industry in 60 seconds. We cover industry news and provide original analysis. About - Construction Today is one tool executives can use to navigate trends in this fast ­paced business. This must ­read publication covers timely issues such as the profound affect construction spending has on the U.S. economy, managing volatile material costs, LEED design and construction, emerging technologies such as BIM and workforce retention. About - Equipment World serves up the latest news in construction, heavy equipment, pickups and everything else that helps you get the hard work done. About - The Construction Index is a building industry & construction company directory with construction news, jobs, tenders, planning leads plus monthly magazine. About - The UK's leading magazine for construction professionals featuring the latest news, expertise and intelligence from the Building industry. About - Construction News is another UK-based magazine. With an emphasis on market intelligence, forecasting, and trend analysis, this resource is great for companies looking to figure out how to stay ahead of the curve. About - Welcome to The UK Construction Blog, a place where everyone is free to post news, comments, products and relevant information about the UK Construction Industry. Everything Surveying, Architectural & Construction Related. About - Canada's leading commercial construction magazine. About - Construction Canada, official publication of Construction Specifications Canada, explores construction projects focused on challenges & solutions for architects, engineers & specification writers. About - To serve the condominium, commercial and residential sectors in the Greater Toronto Area, with excellence and efficiency. To provide quality workmanship and timely completion of construction, maintenance, and refurbishment projects. About - BUILD is the complete, trusted and independent online authority on building and renovation for Australians. BUILD aims to answer all of your questions about building and renovation – even those you didn’t know you should ask! About - Australian Construction Industry Forum (ACIF) is the meeting place for leaders of the construction industry in Australia. ACIF facilitates and supports an active dialogue between the key players in residential and non-residential building, and engineering construction, other industry groups, and government agencies. About - Infrastructure is Australia’s most powerful new communication tool for the infrastructure industry. Uniting the whole infrastructure supply chain, Infrastructure brings together the asset owners, statutory bodies, consulting engineers and first-tier contractors. About - The Masterbuilder is India’s most widely read and referred construction magazine. Our readership extends over to almost every key decision making professionals in the Indian construction industry. It has always been the constant endeavour of the team at The Masterbuilder, to provide readers with the most comprehensive and up to date information about the ever-evolving US$ 5 trillion global construction industry. About - CONSTRUCTION WORLD (CW) is India’s premier and largest circulated construction business magazine, covering the gamut from projects, policies and people to topical concerns, trends and technology, with reason, intelligence and objectivity. About - ConstructionWeekonline.in is the new digital destination for construction professionals in India, and the home of ITP’s industry-leading hospitality publications on the web. About - This blog is an information center where you can find posts related to construction. This content will be very useful for the general public who are searching for construction materials online but first want to do some research on construction or about the construction materials. CONGRATULATIONS to every blogger that has made this Top Construction blogs list! 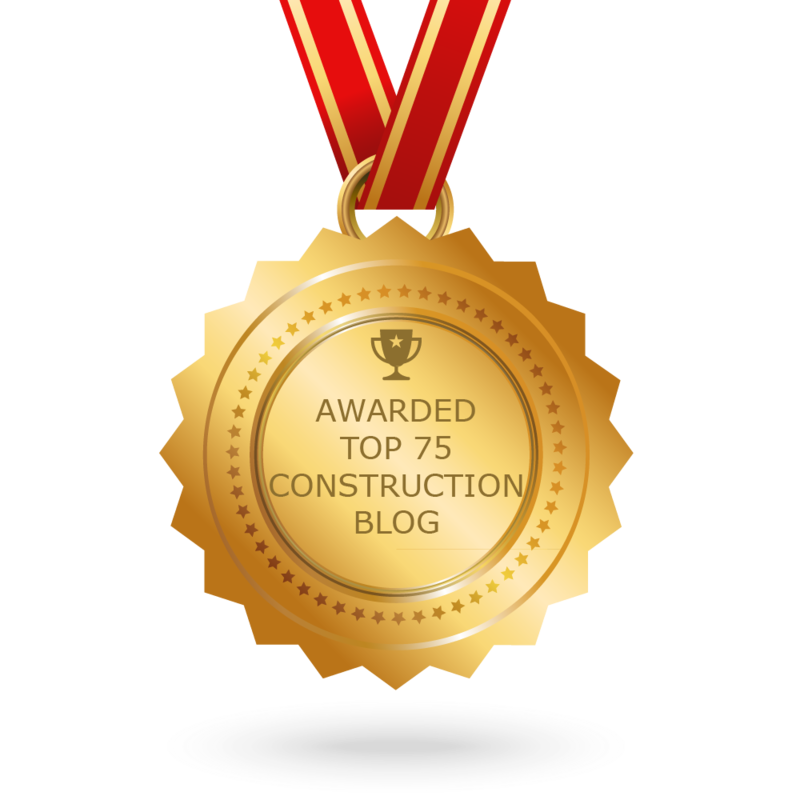 This is the most comprehensive list of best Construction blogs on the internet and I’m honoured to have you as part of this! I personally give you a high-five and want to thank you for your contribution to this world.